Your plants are so beautiful. Whenever I try to grow something they usually die after a few days! your plants and herbs are looking beautiful donna. Beautiful container garden Donna! 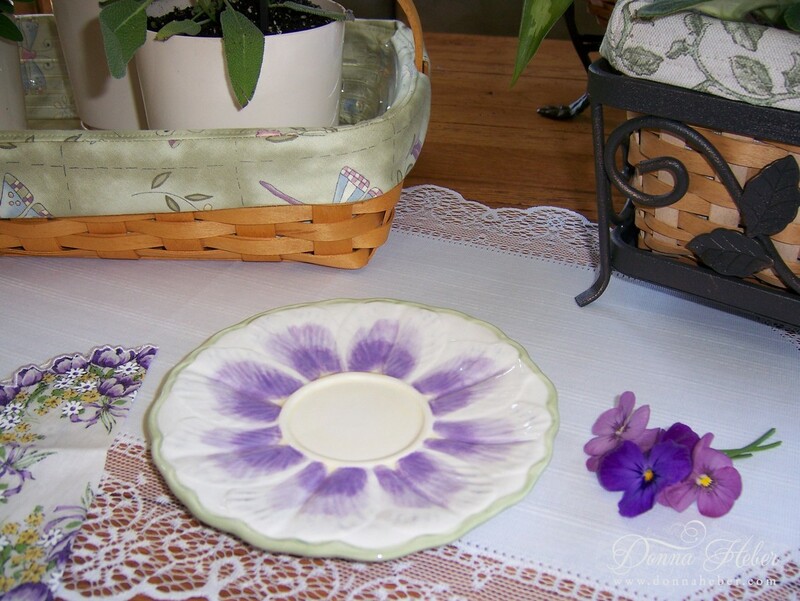 Adore your color coordinated teacup, napkin, and flowers. Very nice. I was just looking out my front door to find a squirrel enjoying the top of one of my beautiful pink tulips. I was blaming the neighbourhood bunny! Wish I knew what to do about these pesky little creatures. He has also been into the Gerbera daisies we purchased on the weekend, but have not planted yet! 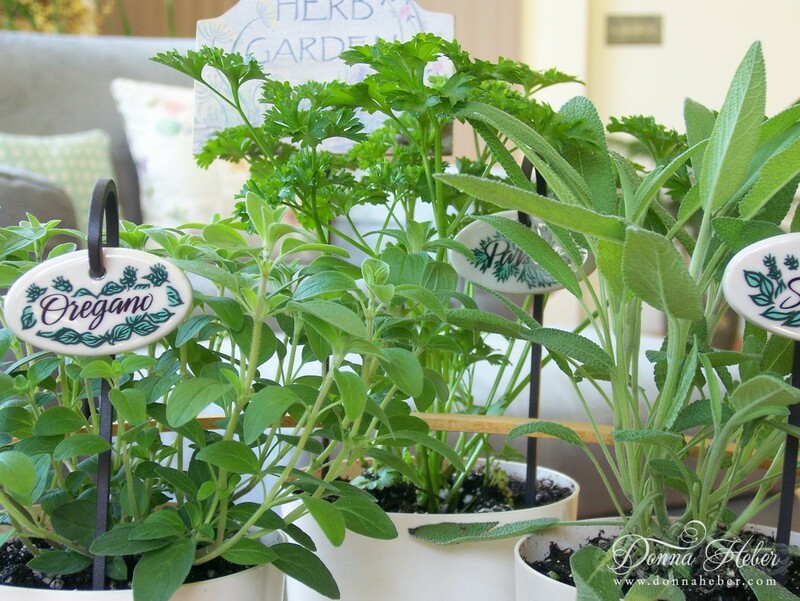 Your herb garden is very cute with its little pots and markers! Love your tea cup too! A charming tea. Thanks for sharing and for joining me today. Have a wonderful week. I really love the herb markers. They do look adorable. And the crocus teacup is so outstanding. I have never seen such one before. Beautiful pics Donna! Your space looks so inviting! I love your little indoor herb garden. 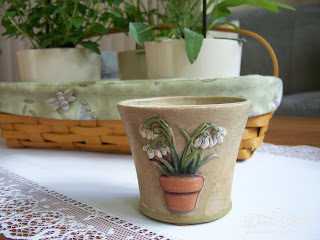 Mine was in clay pots on the kitchen window sill but now are going to be planted outside. 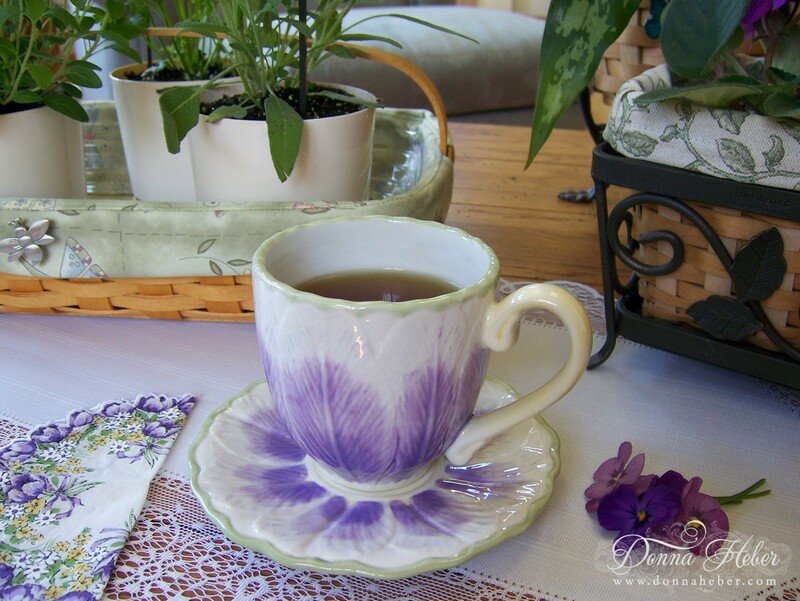 The crocus teacup is adorable. Donna, that tea cup is beautiful! 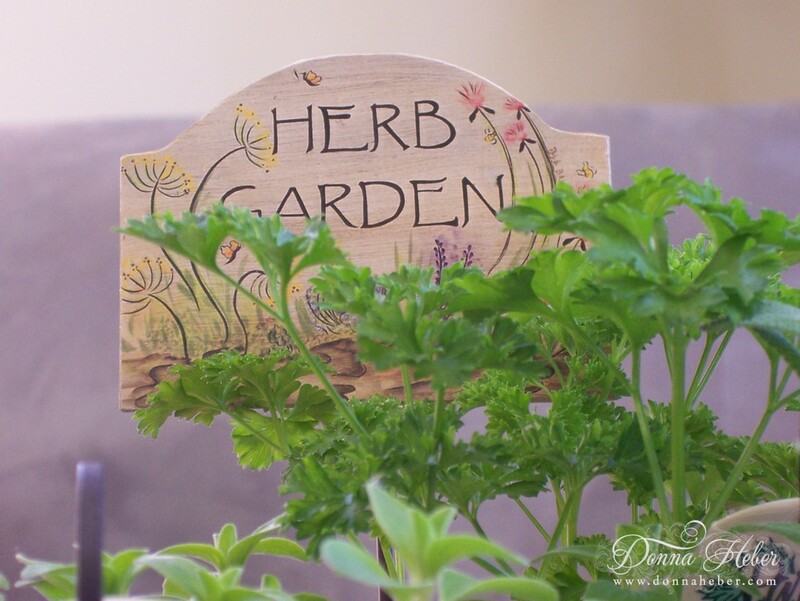 And love the little signs for the herbs. Donna!! What beautiful pictures!!! I love the Teacups and saucers!! I would love to have an herb garden, but unfortunately, my cat would eat them. I can't have any plants!! Very pretty. Looks quite inviting and the fragrances must be so relaxing. Perfect spot to be in after a long days work. Thanks for sharing. 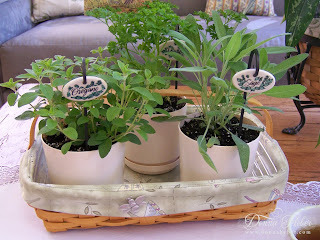 I love cooking with herbs and have a nice herb garden myself. I enjoyed your post. Thank you for inviting to your indoor herb garden for tea. Everything is just lovely. The crocus teacup is lovely and to be surrounded by all your herbs ... what fun! And the fragrances! Happy Tea Day! oh my your plants are georgeous. 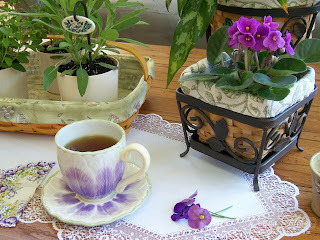 I love that cup and saucer witht he purple. OMG. so elgent and cute. What a fabulous indoor herb garden. 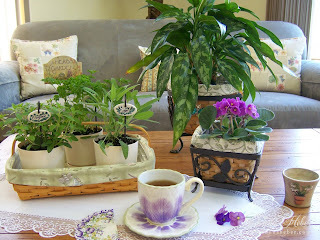 I love the teacup and saucer too. So elegant. Take Care. Love the cup and saucer on your table. So pretty. The tablescape is perfect with the small plants. Don't you just love spring? 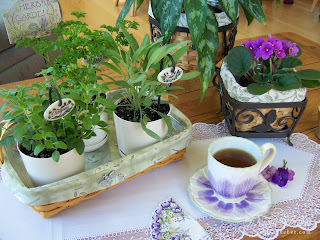 Love the use of herbs and the tea cup is so pretty. I too enjoy fresh herbs. 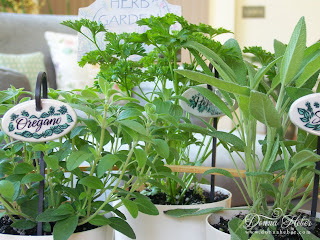 I have had a herb garden that has expanded over the years. Love the tea cup. How pretty. 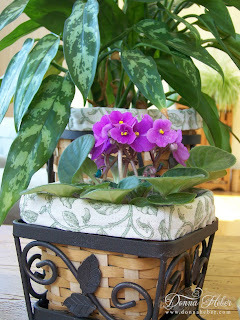 I just love african violets. Yours is gorgeous!